One of the last three of Malaysia's Sumatran rhinos (Dicerorhinus sumatrensis) Puntang, a female was euthanized early Sunday morning after treating veterinarians diagnosed her with terminal squamous cell cancer. She was believed to be around twenty-five years old. Puntang was captured in 2011 and lived out her life in Tabin Wildlife Reserve, a fenced sanctuary, with two other rhinos. She underwent dental surgery in April after caretakers observed a large abscess thought to be due to dental infection in her jaw. The surgery was successful, but the abscess remained. Puntang was euthanized to end her suffering. She was in pain, unable to vocalize and could not breath through her left nostril. It was hoped she would contribute to the rapidly dwindling gene pool of her species, but like other hairy rhinos she was unable to breed in captivity. The live in small, isolated groups and have a very low birthrate which contributes the threat of extinction in the wild. Puntang still produced eggs, so she might have been able to contribute to in vitro fertilization efforts, but her caretakers were unable to retrieve any oocytes. 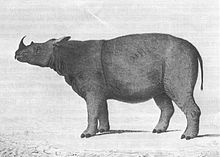 Only 55 to 100 Sumatran rhinos are thought to be still alive; most live in Indonesia.